One weekend down, one to go. Terriers will be at TD Garden on Friday making their record 25th appearance in the Hockey East semifinals. BU will defend its title against Northeastern in a 4 p.m. start that will air on NESN Plus and will be live-streamed on FloHockey (PPV). With four goals and an assist in the quarterfinal series against Lowell—including two game-winners—Joel Farabee claimed his third Hockey East Rookie of the Week award. 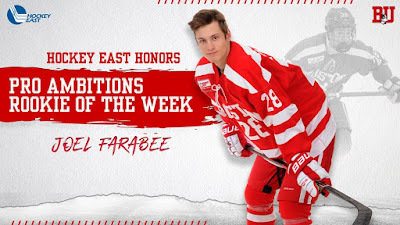 Farabee is the Terrier leader in both points (36) and goals (17) and ranks third nationally among freshmen in points per game at 0.97. Patrick Harper, who had two goals and an assist in game three, and Chad Krys were named to the weekly list of top performers. 2021 recruit Jeremy Wilmer recorded five assists in the North Jersey Avalanche 16Us sweep of the Mercer Chiefs in the Atlantic District Championships. 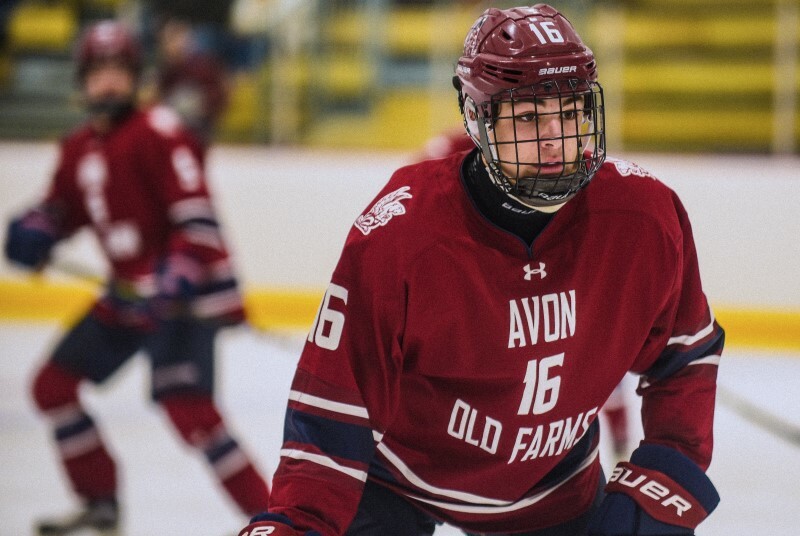 2022 recruit Devin Kaplan had a goal for the Avs, who will compete in USA Hockey’s Tier 1, 16U National tournament in Grand Rapids, Michigan, beginning April 3. Wilmer along with fellow 2021 recruits Tyler Boucher (photo) and Roman Schmidt will be in Plymouth, Michigan, beginning Thursday for NTDP evaluation selection camp for next year’s U17s. Looking back Forty-seven years ago yesterday, BU became the first Eastern college to win back-to-back NCAA championships. The Terriers blanked Cornell, 4-0, behind two goals apiece from Ron Anderson and Ric Jordan and the Most Outstanding Player performance of goalie Tim Regan, who allowed just one goal in the two Frozen Four games. Former BU captain Doyle Somerby has three assists and was plus-five in his last four games for the AHL Cleveland Monsters.